Enticia declares that she's ready to face the music. I have to admit, outside of my main three, Enticia may be my favorite character. Quite a few of my characters have been based on aspects of myself and people I know, but Enticia's been sort of her own entity. She's grown and evolved as a character in ways I never predicted, whether it's on-screen or behind the scenes. Today's strip certainly marks a turning point for Enticia, but it hardly marks the end of her personal character development arc. I have big plans for Enticia in the future...! I typically prefer my comics to have a bit more comedy than drama. If my strip were a cartoon, we'd be coming to the "learning a lesson" part of the episode near the end, so it's a smidgeon more drama-heavy as of late. Still, it's not devoid of comedy; I think that having Unk carrying a grumbling, hog-tied Jackknife over is shoulder is pretty funny-looking. A side note: "Mr. Hellinger's Hardware" mentioned in the first panel gets its name from Hechinger - a hardware store chain that had a store near me when I was a kid - but with the "Heck" syllable changed into its more cussword-sounding form. This is about as close to swearing as my strip will ever get. Also, I was originally going to call the store "Mr. Hellinger's Tools 'n' Stuff", but it didn't fit as neatly in the word balloon, and I hate to miss an opportunity to use alliteration. DON'T FORGET: There's still two months left in my contest! 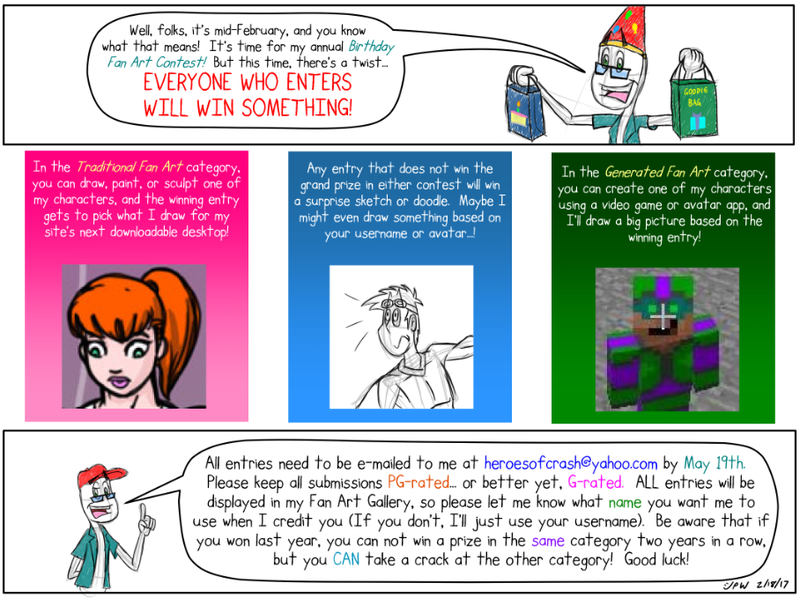 Everyone who submits a valid entry will win some art in return, so get to drawing! Or avatar-building!